Here’s how we got to school every day. Stairs! 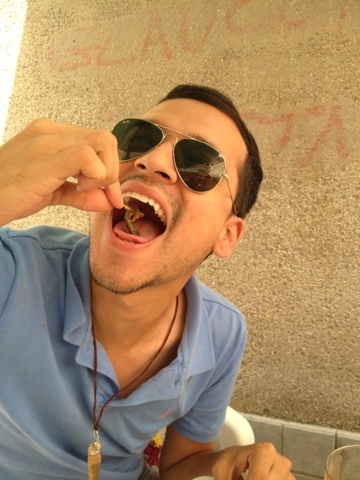 Roberto bravely trying a snail. He loved it. So again, it was a day of class, with a lot of homework. School was something like a kilometer or two away from our apartments (They were technically a hostel, but I call them apartments because the term fits, and more people over here will recognize it.) and it was all up stairs. Literally. 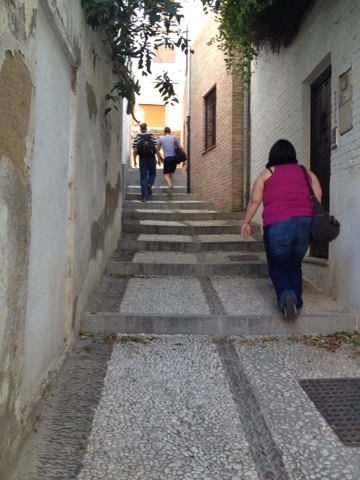 We had to climb stairs the entire way, and even though going back was down, stairs can still be rough. At least one person in the group, who to my knowledge had not had problems with all of the walking in Madrid, her feet started hurting after only a day or two of this. I know I sprouted a few unhappy blisters, and my legs and knees were a lot more tired. 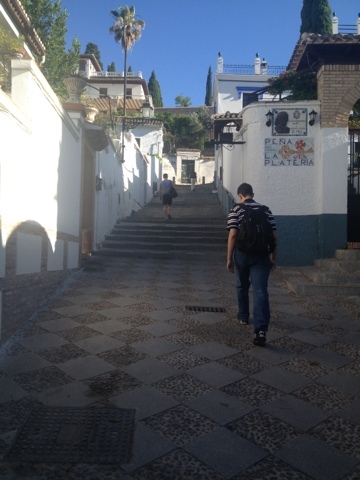 Also, in the part of Granada that we were in, that’s how all of the streets were. 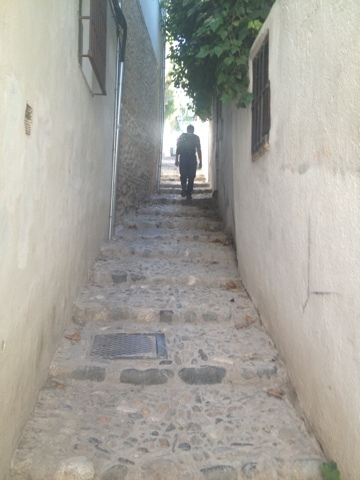 Really narrow, and lots of steps. There are a few streets that are passable by car or motorcycle/scooter, but those are really dangerous to walk down, as the streets are as wide as the cars, and you sometimes have to step into someone’s doorway to avoid a car. 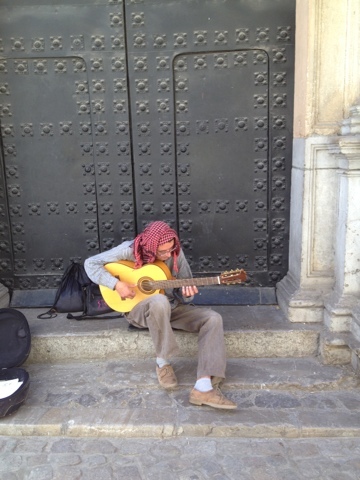 In Madrid, there was an incredible variety of street performers. There were the statue people, who dressed up/painted themselves as statues, and would stand still for an hour or more. Then, you would see the “entertainers” (my term), who were like the Jack Sparrow, moving, posing, but still dressed up. Then, there were street musicians, like the dulcimer group that I will post a video of. Eventually. Finally, the pointlessly annoying heads. You know the little clacking dinosaur heads on sticks that you can get for kids here? Imagine those as all kinds of animals, and then put batteries in them to make them clack continuously. Also, put a sheet out, so it looks like a lump with a head, and you can’t see the person underneath. That’s the clacking heads. I don’t have any pictures, as I usually just ignored them; they were incredible annoying. In Granada, there were street vendors, selling fans, Spain regalia (flags, shirts, paint, etc. ), polishing shoes, drawing pictures, selling watches and sunglasses, and so on. And then there were musicians. Some of these would move, play a song or two at a restaurant, and then go to all of the tables (outside), and ask for money, then move on to the next restaurant. 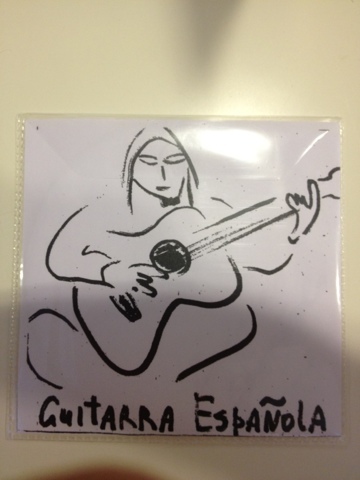 And there were occasional stationary players; the guitarist pictured above was one of these. Some of the people at restaurants played guitar, there was a guy with an accordion, and a violin once. But my favorite was the guy up there. He was in this doorway along the street pretty much every day for two or so hours around noon. 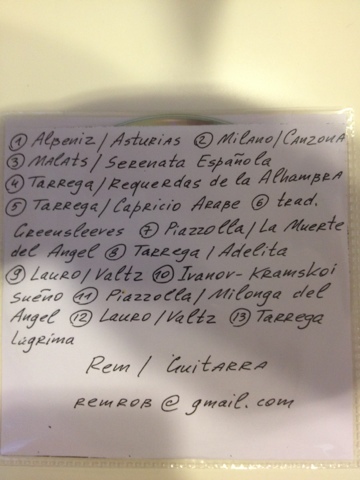 He played many things from his CD, and the first time I heard him, he was playing Lágrima, by Francisco Tárrega, a piece that I’ve played for many years, and instantly recognized. I stopped to listen to him on at least 4 different days, because he played really well, and he played my favorite type of music. His CD is really good, I’m enjoying it. And yeah, a snail. I didn’t try those, I just took pictures. I’m glad someone enjoyed them.